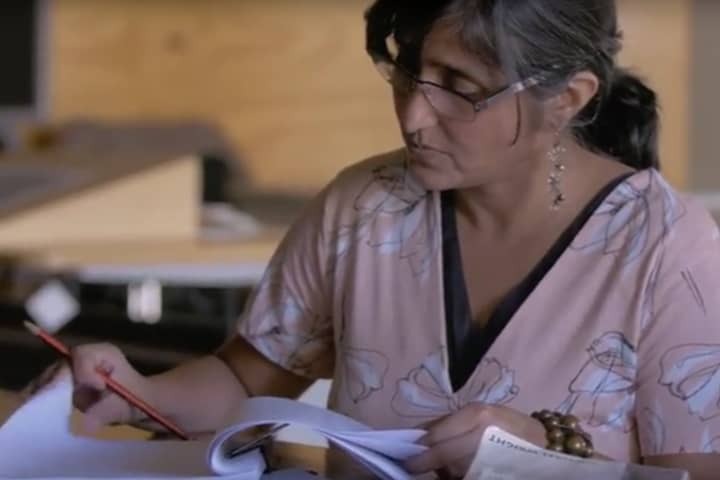 To complement the Meet the Director and Designer video with Petra Kalive and Andrew Bailey, these revision activities will assist you to analyse further Rashma N. Kalsie’s world premiere production of Melbourne Talam. How does Petra Kalive (Director) describe the fourth wall in Melbourne Talam? Revisit the Education Pack – Part B (page 2) for more insights from the director. What are some of the performance styles Petra Kalive mentions? 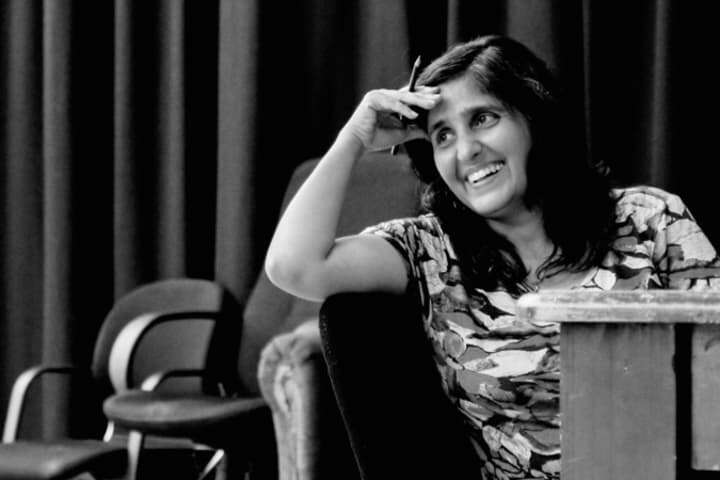 Identify the moments presented in the performance footage as Petra describes performance styles (for example, Sahil Saluja playing Sonali’s bespectacled neighbour Martha as an example of melodrama). What other moments from the performance could you refer to as examples of performance styles? Make a list of the adjectives Andrew Bailey (Set & Costume Designer) uses to describe Flagstaff Station. How does Andrew Bailey describe the inspiration for including treadmills in the set design? Discuss moments where the treadmills are used to ‘stretch the space out’. Recall the wedding dance scene shown in the performance footage. Describe how stagecraft elements were used to enhance this scene. Note the set model presented in the video. Revisit the Education Pack – Part B (page 8) for more information about Andrew’s design concept. What are the ‘iconic bits’ of Flagstaff Station that appear in the set design? Read the Backstage story about how MTC Scenic Artist Tansy Elso recreated Flagstaff Station. How does Andrew Bailey describe his reason for including swivelling benches in the set design? Identify some moments when the benches were used to isolate spaces. Revisit of the Education Pack – Part B (page 17) for more about using the benches non-naturalistically. How does Petra Kalive describe the themes of Melbourne Talam? How were costumes used to help the actors play multiple characters? From the moments shown in the performance footage, which one resonated most strongly with your memory of Melbourne Talam? Explain how set design was applied to convey a theme in the performance of Melbourne Talam. Identify conventions of the performance style(s) that were manipulated in the performance of Melbourne Talam. 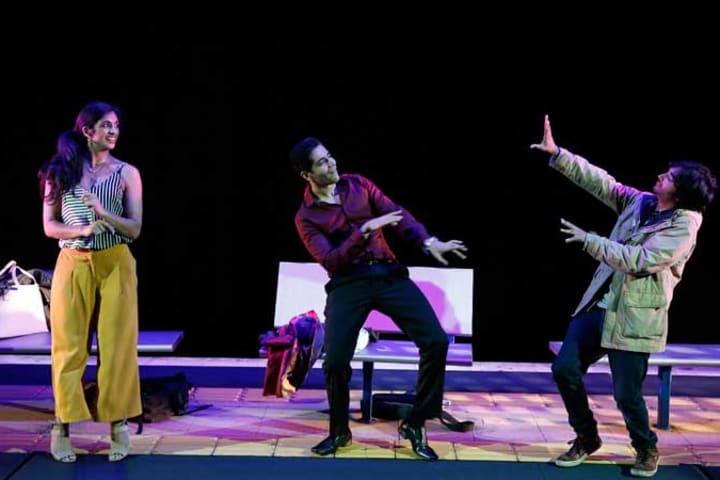 Evaluate how pathos and the actor-audience relationship were manipulated in a specific moment of the performance of Melbourne Talam. Analyse how the job interview scene was enhanced by set design in the performance of Melbourne Talam. Evaluate how the stagecraft element of costume design was applied to convey a theme in the performance of Melbourne Talam. Evaluate how conflict and transformation of place were manipulated in the performance of Melbourne Talam. 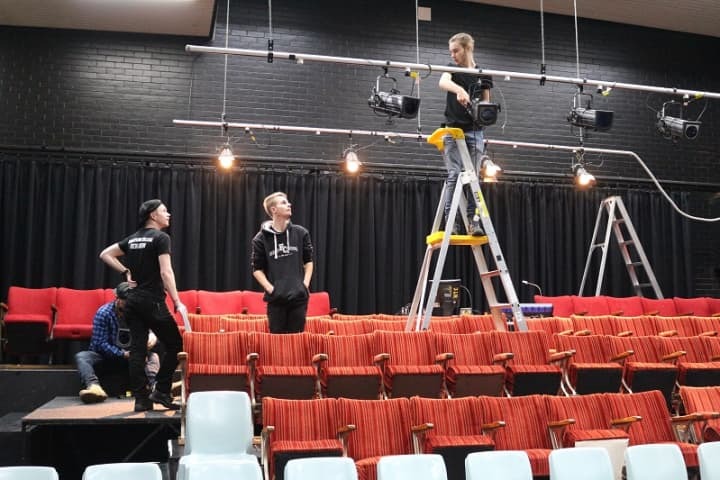 Analyse how two areas of stagecraft were manipulated in a non-naturalistic way to enhance a dramatic moment in the performance of Melbourne Talam. Revisit the Education Pack – Part B (page 28) for more analysis questions about specific moments in Melbourne Talam. Want more revision activities? Meet the cast of Melbourne Talam here. Remember to always consult VCAA documents when preparing for your VCE exams.